While some regions have had catastrophic damage that will hamper repairs, we expect to have the vast majority of customers restored by the end of the day Monday. RICHMOND, Va., Oct. 12, 2018 /PRNewswire/ -- Dominion Energy will continue to work around the clock and throughout the weekend to restore service to customers who lost power in the wake of Tropical Storm Michael. As of 3 p.m. today, more than 250,000 of the approximately 600,000 customers impacted have had service restored. 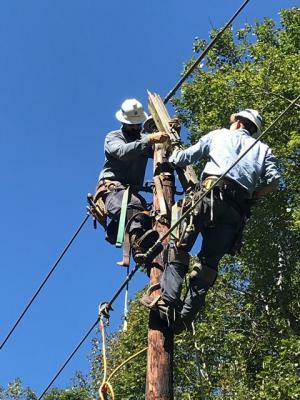 "We've dedicated more than 6,000 people to this restoration effort, including mutual aid crews from other states that are here to assist us," said Ed Baine, senior vice president – Electric Distribution. "Our focus will be to reach and restore all customers as soon as quickly and safely as possible. While some regions have had catastrophic damage that will hamper repairs, we expect to have the vast majority of customers restored by the end of the day Monday." Early reports confirm significant damage in many regions of Virginia and North Carolina, with pockets of catastrophic damage in south-central portions of Virginia and Gloucester/Northern Neck. There was also significant damage in Central Virginia, the Tidewater area and northeastern North Carolina. Patrol teams are out in force, assessing damage, gathering data and ensuring site-specific materials and equipment are ready for each restoration job. They are finding significant damage, including broken poles and cross-arms, downed wires, fallen trees, and blocked roads. The focus today is on working with local public safety and emergency officials to restore power to essential services and facilities critical to public health and safety, such as hospitals, fire and police departments, and public water systems. As of 3 p.m., 215 of these facilities remain out of service and will be restored as soon as possible. Once critical services are restored, crews will be assigned to work on returning service to the largest number of residential and business customers in the shortest amount of time. When major repairs are completed, the focus will shift to restoring smaller groups of customers and individual homes. We appreciate the patience of all of our customers as we work through this multi-day restoration effort. Once we have a more complete assessment of all damage, we will be able to provide individual estimated restoration times for customers. Report outages: Don't assume we know you are without power. Use your mobile device and go to https://www.dominionenergy.com/outage-center/report-and-check-outages or call us at 1-866-DOM-HELP (1-866-366-4357). Stay away from downed power lines: Assume they are energized and dangerous. Keep family, neighbors and pets at least 30 feet away and call us at 1-866-366-4357. Choose the option to report a downed wire. Use caution when operating generators: Follow the manufacturer's instructions exactly and always operate outdoors with good ventilation.